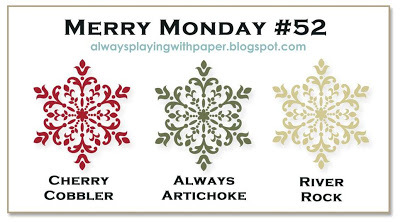 I combined 2 challenges for this card.....the color challenge over at Merry Monday to use Cherry Cobbler, Always Artichoke and River Rock, and the sketch challenge from Freshly Made Sketches. The snowflakes are from the Snow Flurry Bigz die and I used Always Artichoke brads in the middle to secure the pieces together. Always Artichoke was also used as a backing for the River Rock panel going across the middle. I thought that the panel looked a bit plain behind the snowflakes so using Versamark I stamped a snowflake from the Snowflake Soiree set. Beautiful card! I love the snowflakes and the pattern paper you used. Thanks for joining us at Merry Monday. I love this, Lisa! 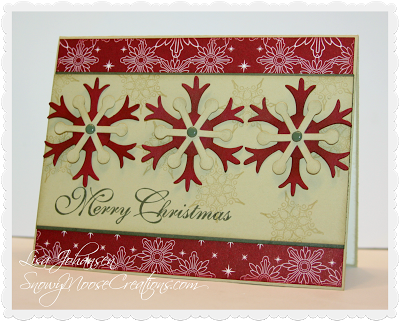 The subtle stamping behind the die cut snowflakes takes this to an even higher level! How nice that you had some real snow to go with it! Thanks for sharing it with us at Merry Monday! Lovely card, I like how you used the Snowflakes and the pretty Cherry Cobbler DSP. Thanks for joining us at Merry Monday. Wow, this is awesome! Your snowflakes are stunning! Great way to use the Merry Monday colors this week! Absolutely beautiful Christmas card! So glad you joined us at FMS! What a great card, Lisa! Love the snowflakes and the paper you used! Lisa, this is beautiful! I love that colour combination! The snowflakes are fabulous!! Love the green brad centres! Thanks for joining us this week at Freshly Made Sketches! Gorgeous card, Lisa. Love how you combined both challenges and the snowflakes are great in those colours. First of all I just love the name of your blog...how extremely creative, and I take it you live in a snowy snowy part of the country! I just love your pictures of the Moose! Then your card, wow, I love the snowflakes, what a great take on the sketch challenge. I initially came to thank you so much for your encouraging comments that you left on my blog, but I needed to let you know how much I just love your card too!! While here I became your latest follower. I would love it if you would come and become one of mine too.